iaxRPT is a softphone forked from the famous Open Source iaxCommm. Jim Dixon WB6NIL has modified it to adapt it to app_RPT in Asterisk, to be able to command the PTT remotely. 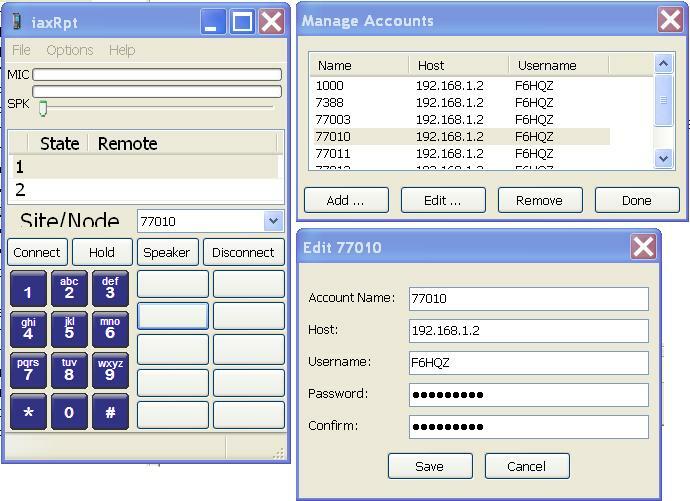 The only difficulty is to well understand what is realy necessary to input in the fields, permitting to create the Asterisk IAX2 accounts. "Account Name" must contain the extension number attributed to your correspondant or the station (the "Node") to call (a simplex VHF TRX or a repeater). "Host" must contain the Asterisk's URL or IP address from which your are a subscriber. "Username" must match with your account name as it's recorded into Asterisk which you are a subscriber. "Password" must match with your password as recorded in the Asterisk account which you are a subscriber. "Confirm" must receive the same pasword input for confirmation. Then, save and close the accounts window.